This season's contestants for the reality show, Darwin's Quest, the Search for the Ultimate Survivor, feel very fortunate to have been selected for the competition. 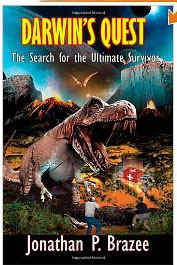 As with other shows, the contestants battle extreme dangers which end up killing them--but they are revived and face the viewer's votes to re-enter the game. All seems to be going well when an unexplained disaster leaves them stranded. No more medical reviving. No more support. The dangers they face go beyond entertainment and become a real life-and-death struggle. I won't go into how well-written or poorly- written this book might be as I am the author, but give it a shot. This book was a true joy to write, and I hope it is a joy to read. I just read Darwin's Quest on my Kindle, and I do think the book is good (of course, that could be the proud papa speaking.) You can download the book from Amazon for only $0.99. I get a whopping 35 cents per download, so I am not doing this for the money. I just want people to read it. So this is a blatant plea. If you have a Kindle or have Kindle for PC downloaded, please spend the 99 cents and get this book. And let me know what you think of it. For more reviews or to buy Darwin's Quest from Amazon.com, click here.